This seems to be the case to this day. But we can do something about this regrettable circumstance, or at least start to. I would like to shift gears this week. My intention in this series on Buddhist meditation has a strong historical aspect. So far I have tried to take a snapshot of Buddhist meditation at the time of the Buddha, that is, Buddha’s meditation, relying exclusively on the earliest Buddhist texts. I think a clear picture of the Buddha’s system has emerged. Particular passages in the suttas may be debatable, but overwhelmingly the suttas support a clear model, that makes systemic or functional sense, and that can be verified in practice. Now, Buddhism spread in its early centuries over a large geographical area, coming under the influences and demands of exotic innovators and brilliant cultures, it evolved. I want to look at the ways meditation seems to have evolved to give us the daunting plethora of meditation methods. And to make it interesting, I would like to speculate about why it evolved. Let me recount some history of Buddhist in China. I am not an expert in this history, so if any readers are, or are inclined to look things up, please post comments correcting my account or, more likely, enhancing it. Buddhism began to enter China in the First Century A.D., so maybe six hundred years after the death of the Buddha. The primary influence came along the Silk Road through Central Asia, actually passing north of Tibet and into China. Buddhist merchants carried not only goods and Buddhist practices, but also monks, probably initially for good luck as caravans made the long and dangerous trip. Mahayana Buddhism did not yet exist as a recognizable school in India; this was about the time of the earliest sutras, such as the Prajnaparamita Sutras, that would one day be regarded as Mahayana. In the centuries that followed Northern India seems to have been a hotbed of innovation, producing much scholarship and literature. The Buddhist universities flourished, and philosopher-monks like Nagarjuna, Vasubandhu and Shantideva, were exploring and extending Buddhist philosophy, much like Western philosophers have been doing in a separate tradition over a similar span of time. Alongside this new sutras were being composed, and attributed to the Buddha. These tended to be much more colorful than the old ones, with a much richer mythology, and with new recurring easily befriended characters, like Avalokiteshvara, Manjushri and Samantabadhra. Many Northern Indian influences trickled into China over the years and occasionally a Chinese pilgrim would make the journey to India to stock up on books. China was a highly literate land for its time and the Buddhists were eager to absorb as much as possible from India and to translate it into Chinese. Formidable translation project were set up. The best known translator was an Indian monk named Kumarajiva, who was originally captured in a Chinese raid in Central Asia in the Fourth Century, but stayed voluntarily in China for many years. The Sanskrit Agamas, corresponding to the first four Pali Nikayas (Sutta collections) were translated, along with philosophical works and Mahayana Sutras. Now the primary indigenous cultural/religious influences in China were Taoism and Confucianism. Taoists were something like beatniks and Confucianists were more like Victorian aristocrats. The former seemed to be more accepting of Buddhism, and in fact much of the new Buddhist vocabulary, the Chinese translations of Sanskrit Buddhist terms, were adapted from Taoism. 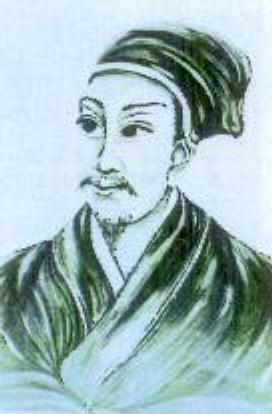 Both Taoism and Confucianism became strong influences in shaping Chinese Buddhism. 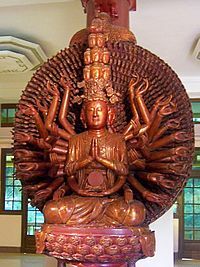 Schools of Buddhism in China formed for the most part by championing a particular Mahayana sutra. 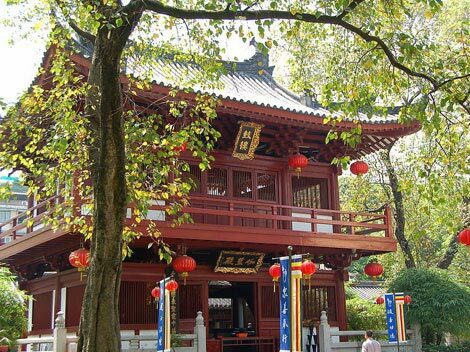 Early on in China four main schools of Buddhism stood out: Pure Land (based on the Amitabha Sutra), Chan (Japanese, Zen), Hua Yen (Japanese Kegon, based on the Flower Ornament Sutra) and Tian-tai (Japanese, Tendai, based on the Lotus Sutra). Zen was unusual in that people seemed to have trouble making up their minds about which sutra to champion, but the Diamond Sutra, whose topic is emptiness, stands out as a Chan favorite. Chan is particularly interesting for us because it is the “Meditation School.” “Chan” is short for “Channa,” which was a transliteration of Sanskrit “Dyana,” which corresponds to Pali Jhana, a word that we have seen quite often in this series. Chan spread, like most of the other schools, along with Taoism and Confucianism throughout the Land of the Chopstick, which includes Korea, Japan and Vietnam, where I think it is known as Son, Zen and Tien respectively. Of course its Japanese variant is best known in the West, particularly in America. I’ll call the entire school Zen, since that word is common in English. Many people do not realize that Thich Nhat Hanh represents the Vietnamese branch of Zen. There are a number of challenges in tracing the evolution of meditation in East Asia. First, there are relatively few meditation manuals. This is not surprising, since one generally learns meditation under the tutelage of a teacher who can personalize it according to one’s own proclivities. I cannot recall any Indian Mahayana meditation teachings, for instance. One of the earliest works on meditation from China is the Mohe Zhiguan (Great Serenity and Insight) by early Tian-tai Master Zhiyi (538-597), written roughly about the time the Visuddhimagga was being composed in Sri Lanka. This very detailed and analytical work is said to have had some influence on the early Zen school. However Zen itself has generally eschewed all things analytical or intellectual; its writings tend to be poetic. And rather than presenting doctrine directly it tends to dance around it in such a giddy and playful manner that you can barely tell what it is not saying. This inscrutible expository method spun off the well-known but poorly understood koan literature and is almost certainly due to a strong Taoist influence. We find various references to meditation in the historic Zen literature, but it tends to be more descriptive of experience than technique. Next week I will site some references. We know that around 1100 AD a new innovation arose in Zen meditation in China, the use of koans as actual objects of meditation, which became all the rage within the Lin-Chi (Japanese, Rinzai) subschool school of Zen. 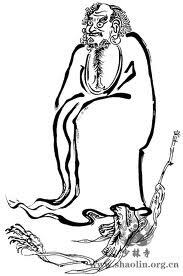 The great poet of Zen, Master Hongzhi of the Tsao-Tong (J. Soto) subschool of Zen provided a more conservative counterpoint to this new innovation, writing some wonderful descriptions of samadhi which I will also cite. 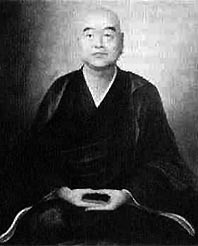 Born in 1200, Dogen Zenji, the great Japanese Zen master, received his most significant training at the monastery where Hongzhi had been abbot a century before, and brought Soto Zen to Japan. Dogen also wrote some significant descriptions of Zen meditation, which have had more influence on the Western understanding of Zen meditation than anything other single source. I would like to cite some of what Dogen has to say as well. Because I trained for years in Dogen’s Soto Zen tradition I am able to supplement his descriptions with my own experience according to how it has been taught to me. I will try to make use of (this modern understanding of) Dogen’s meditation as a snapshot for comparison with Buddha’s meditation. I have relatively little understanding of Rinzai koan-based meditation and would welcome it if anyone out there who does would attempt a similar comparative analysis. This entry was posted on January 22, 2012 at 9:38 pm and is filed under buddhism, dhamma, Dharma, Eightfold Path, jhana, meditation, mindfulness, samadhi. You can follow any responses to this entry through the RSS 2.0 feed. You can leave a response, or trackback from your own site.